We’ve long held the opinion that advanced data visualization, or – probably more accurately – just simply ‘data visualization’ is the cornerstone of modern self-service Business Intelligence (BI). If a picture really is equivalent to a thousand words, then the implications and understanding able to be derived from intuitive and accurate data visualization might be more akin to Leo Tolstoy’s infamous 1869 classic, War and Peace. Perennial talking head, renowned analyst and Forrester Research’s gun-for-hire, Boris Evelson, has been spruiking recent results and analysis from Forrester’s latest study on data visualization – The Forrester Wave: Advanced Data Visualization (ADV) Platforms, Q3 2012 – that vindicate the critical nature of advanced data visualization applications, abilities and techniques in his corporate blog post entitled Advanced Data Visualization Makes BI Stand Out. The post offers brief highlights and insights from the Forrester report, which provides a checklist of advanced data visualization – or ‘ADV’ as Forrester calls it – requirements and best practices. This point is fairly irrefutable. And one with which we agree. However, the details of the Forrester report have come under fierce fire from data visualization expert, Stephen Few. This is not the first instance in which Few has attacked the work of Forrester Research, and more particularly, that of Boris Evelson. Back in January of this year, Few launched a no-holds-barred attack on Evelson’s data visualization credentials in a not-so-subtly titled post – Boris, speak only of what you know. “If Evelson wants to express useful opinions about data visualization, he’s got some learnin’ to do. This is true of many BI thought leaders. Until then, they should stick to what they know.” A fairly uncompromising assessment of Evelson’s work. The subsequent comment stream (positioned beneath the article) involves an exchange, of equally disdainful tone, between Few and Evelson. An exchange only tempered by each party’s fragile adherence to a sense of obligatory professionalism. 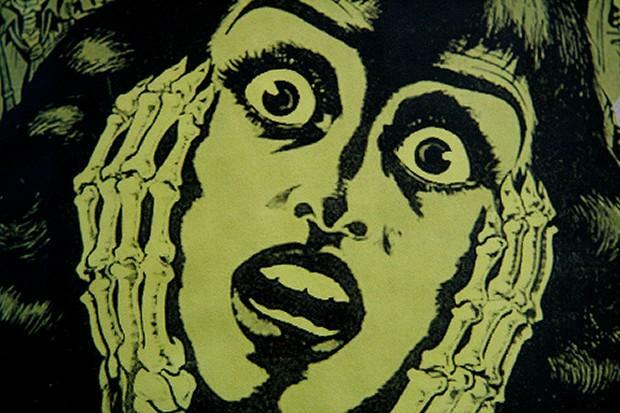 Few’s latest hardnosed retort to Boris’ most recent research, provocatively titled Hollow Guidance from Forrester for $2,500 or Useful Guidance for Free – The Choice is Yours, is of an equally indignant nature. Few’s barrage begins with this taunt: “I suppose that some reports might actually be worth the price of 50 books on the topic (at $50 each), but I’m certain that this report isn’t on that list. How can I be certain without reading it? (No, I didn’t pony up $2,500.) Because, based on his previous work, I know that Boris Evelson understands little about data visualization and is misinformed in many respects”. 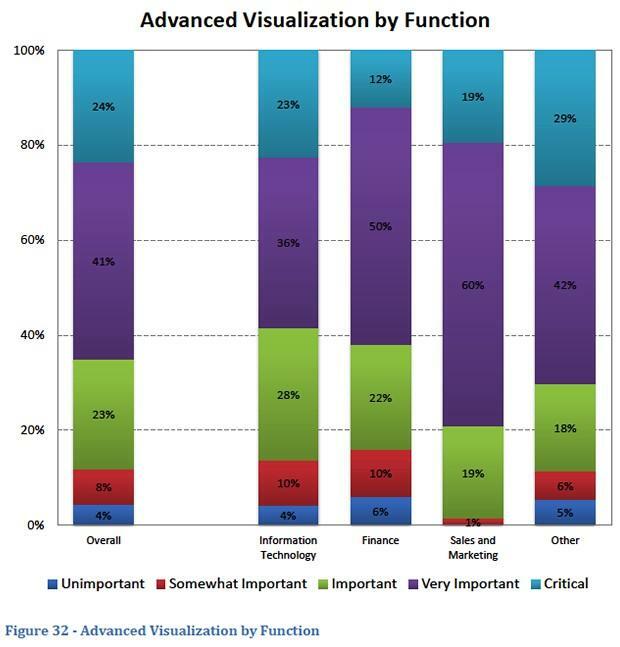 Among others, one of Few’s major gripes with Forrester’s report on advanced data visualization is that “Forrester is just talking about basic information visualization as defined by Card, Mackinlay, and Shneiderman in 1999” as opposed to discussing, analysing or categorizing anything new or ground-breaking. Not satisfied with his initial dissertation, Few continues the onslaught in successive additional comments, insinuating a lack of knowledge, credibility and ethics; describing the Forrester report as “impoverished work” and “more misleading than it is helpful”. But despite the big hoo-ha and feigned hysteria, isn’t this a case of one salesman shooting down another just so that he can – directly or indirectly – line his own pockets? It’s difficult to say. Ascertaining the motivations behind this apparently bitter spat isn’t our objective. It’s simply safe to say that the definition and successful application of data visualization remains hotly debated. What’s more certain, is that demand for data visualization capabilities is growing. Howard Dresner’s latest Wisdom of Crowds Business Intelligence Market Study – based on 859 responses from professionals with first-hand experience using vendor products and services – analyzes market place trends throughout 2011 and assesses user perceptions towards BI for the coming year. 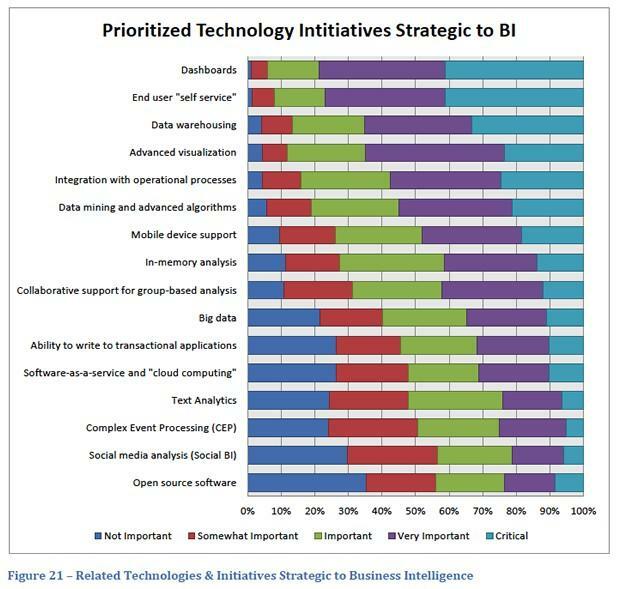 The report found that “advanced visualization” was the fourth most sought-after strategic BI technology behind BI mainstays dashboards, data warehousing and the now pervasive concept of “end user self-service”. Dresner notes that advanced visualization techniques are often aimed at assisting users to understand complex data relationships. Based on this statement, it seems obvious that those users from non-technical business-oriented backgrounds – such as sales and marketing – would prioritize such features most strongly in order to derive meaning (and therefore value) from corporate data assets. While only one percent of survey respondents from sales and marketing backgrounds considered advanced data visualization functionality to be anything less than “important”, it’s clear that this result is part of an overarching trend towards self-service BI. 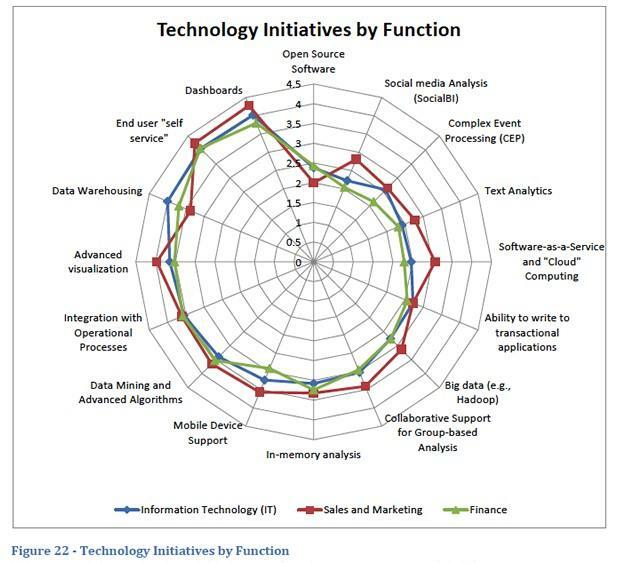 The above spider chart demonstrates that many of the technical BI features aimed at enabling the meaningful consumption of data analysis – dashboards, Mobile BI, Collaborative BI, advanced visualization as well as self-service BI itself – are given higher priority by the wider community of BI consumers (as opposed to report builders / information developers). Coincidence? We think not. There’s been a lot of discussion recently amongst analysts and enterprise IT media about the uptick in interest in BI, and its actual deployment, amongst healthcare providers and health-related institutions. Not only the rise in planned and implemented BI initiatives, but interest in equipping non-technical users – medical practitioners of varying types – with independent access to reporting and analytics in order to better manage procedures and patient care. 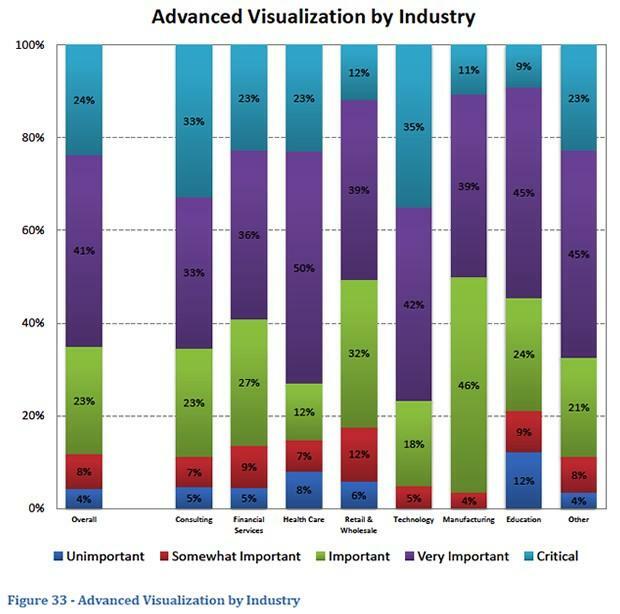 Perhaps then, it’s no surprise either that healthcare ranks alongside the technology sector as the two industry segments with the “highest degree of interest in Advanced Visualization”. Understand how to harness a “Business Intelligence Renaissance” and why Yellowfin was rated No.1 in Dresner’s 2012 global Wisdom of Crowds Business Intelligence Market Study. Attendees will also receive a free copy of Dresner’s Study. We look forward to seeing you there for some interesting – but not too fiery – discussion about emergent BI marketplace trends and the continued shift towards the all-encompassing notion of consumer-oriented analytics.